THIS IS the time of year when all sorts of marketing wheezes are devised to squeeze something out of your wallet in the name of Christmas. The art business is no exception. 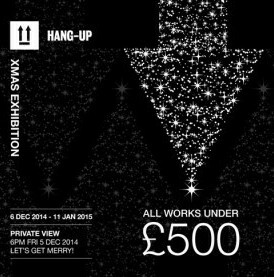 Hang-Up, a Stoke Newington gallery that has built a powerful online presence to attract clients to its limited-edition prints, has just announced what it terms a Xmas Exhibition. An artwork for £500… a good investment? Perhaps, but the press release and the poster below raise some questions, and here are the answers, which the manager was quick to provide: “All of the works on display by our gallery artists are either brand-new works produced exclusively for the show, or their most recent releases. She openly said that none of the works on show had been reduced in price or put “on sale”. She admitted that most works sold by Hang-Up cost “over the £500 mark”. There you have it: the works have been created for the Christmas market. Or, as Nizzola says: “There will be a diverse range of urban and contemporary artworks, framed and unframed, ranging from just under £100 to £500. * Xmas Exhibition at Hang-Up Gallery, 56 Stoke Newington High Street, Hackney N16 7PB (020 3667 4552), Sat 6 Dec 2014-Sun 11 Jan 2015 Wed-Sun noon-6pm. Entry: free. Disabled access to ground floor.